STRUTHERS, Ohio — In the 1970s, I enjoyed taking pictures of trains traveling on railroads in the Mahoning Valley. I had a good Canon film camera and shot a lot of 35mm slides on Kodachrome film. Back then, the Detroit Edison Co. ran trains from Detroit to the coal fields of Pennsylvania to procure coal for their power plants. These trains were routed through the Mahoning Valley on the Lake Erie & Eastern and the Pittsburgh & Lake Erie railroads. To keep tabs on the activity on railroads, I kept a railroad-band VHF radio on my desk as I worked. One bright sunny day in early January 1975, I heard aneastbound Detroit Edison train calling for a signal at “Graham,” an interlocking tower in Struthers. I grabbed my camera and headed to Bridge Street to take a shot of the train coming across the LE&E bridge over the Mahoning River. The resulting picture (top of page) depicts what was then the very essence of the Mahoning Valley. 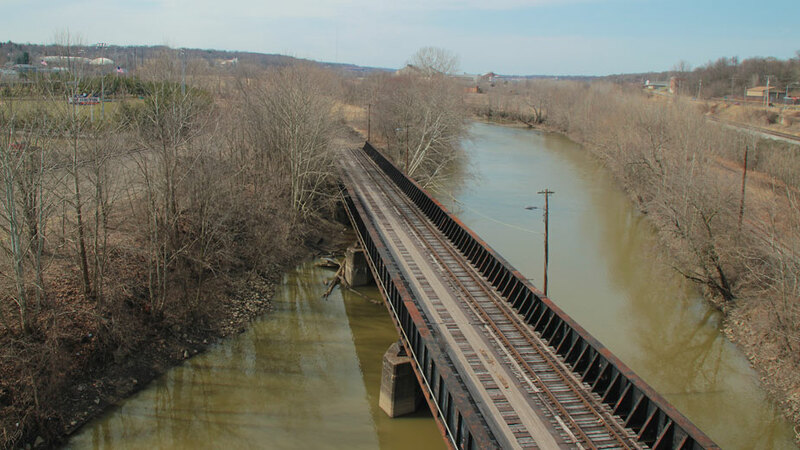 The Detroit Edison train is crossing the bridge over the Mahoning River and will move off the bridge to the P&LE River Track to continue on east. All the steam at the left is emanating from a freshly quenched batch of coke, produced by the coke works of Youngstown Sheet & Tube Co. The furnaces and the rolling mills of the YS&T Campbell Works dominate the center of the picture. To the right is the vast P&LE Gateway Receiving Yard, filled with revenue-generating freight cars. Steel making and railroading were major industries in the Mahoning Valley in the 1970s. As I scanned this old Kodachrome 35mm slide into my computer (pictured at top), the thought struck me that I could duplicate this shot today. Below is an image shot at the same location in March. The steel mill and the P&LE railroad are gone. In fact, everything except the bridge itself is lost to history. The beginning of the end took place Sept. 19, 1977 – Black Monday – when the Youngstown Sheet & Tube Co. announced it would close its steel mills. Over the next decade the P&LE railroad struggled to survive. But without the steel mills, which were its largest customers, it ultimately closed up shop in the early ‘90s. The huge P&LE Receiving Yard is now an empty field filled with weeds. The LE&E railroad is also gone. This was the railroad that ran along Poland Avenue on a long, elevated fill. It ran through downtown Youngstown on its seven-mile route from Struthers to the YS&T Brier Hill Works that straddled Girard and Youngstown. Construction of the LE&E railroad was completed in January 1915. Because of all the elevated track and bridges needed to get through Youngstown, the LE&E cost the mammoth sum of $1 million per mile to build in 1915. That equates to more than $25 million per mile today. Only a few abandoned viaducts and a couple of massive steel bridges remain of this once busy railroad. The old right of way is either overgrown with vegetation or reclaimed for commercial and industrial use. The railroad bridge in these two images is still used today by a local short line for interchange traffic to CSX. Time marches on, but sometimes I wonder where the march is headed. EDITOR’S NOTE: The author, Richard Melvin, worked for the P&LE Railroad in the late 1960s then went to work for WYTV. In the mid-2000s, he was superintendent of operations for the Ohio Central Railroad’s Youngstown Division. Today he is semi-retired and a freelance commercial pilot who flies corporate aircraft. His father was Paul C. Melvin, who wrote columns for this newspaper in the mid-2000s. FLASHBACK is sponsored by Hickey Metal Fabricating Inc., based in Salem.